I have been working on my Workshop Schedule for 2018 and have some exciting new studios in areas across the US that I'll be headed to! Please check it out and come learn this fun technique with me! I'm going to be teaching in my home studio as well starting in February. My space is small, so seats are limited, but it will be a cozy, fun time for anyone that wants to see where it all happens! I'd love to see you at any of these wonderful locations -- Rhode Island, Utah, Arizona, Washington, Maryland, California, Oregon -- Here I come!! I want to share this really great video that shows pictures of my work with the techniques I will be teaching in my workshop as well as the dates and details of the workshop at AAE Glass next February. There will be two sessions, so please choose the dates that work for you and come on out to their amazing new shop/studio/classroom! Contact AAE Glass for more information or to sign up TODAY! I wanted to be sure to get you all the information for the upcoming art shows I have this holiday season. I hope you can make it out to one or all of these shows in the Bend, OR area to pick up some wonderful holiday gifts - whether you buy from me or any one of my fellow artists, you are sure to score some wonderful handmade items at these great shows! 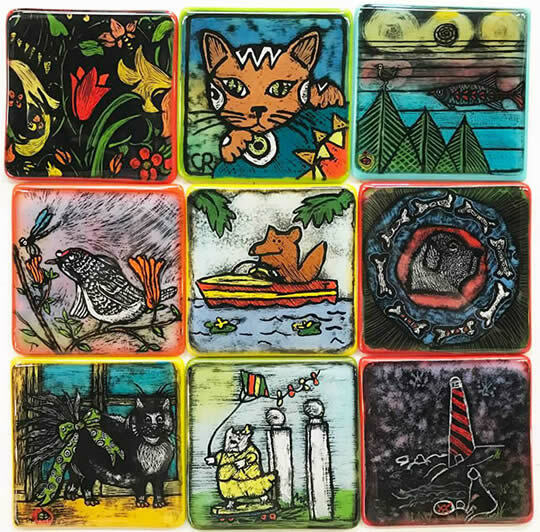 I have been getting around the country quite a bit teaching workshops of my Reverse Glass Enameling process. It has been, at times, fun, rewarding and exhausting, but always an adventure! I have met some amazing human beings and seen parts of the country I might not ordinarily get to in the course of my lifetime. I have set up booths at several art shows since the middle of July - in Salem, Sunriver, Bend, Tigard - and have three more coming up in the next few weeks. I've also been working on some new designs as well as turning some of the new and some old designs into wall hanging tiles as an alternative to bowls. I love the little spots of color these provide to any little corner or wall space. Somehow the husband and I have even found time to get out and do a little camping before the snow hit our area. We did a little trip through Portland and over to the coast, down a bit and back through the Detroit Lake area heading home. It was fun and the dogs just LOVED running on the beach. I really hope your summer and fall have been full of great things for you and your family, too. I look forward to catching you all up on what is coming up for me real soon! This weekend will be my second year with a booth at the Sunriver Art Fair in b-e-a-utiful Sunriver, Oregon! I'm looking forward to this show and have several new pieces and designs to show you, so I hope you will stop by to say "Hi" and check it all out. I'm off again to teach my Reverse Glass Enameling Workshop in Mt Vernon, WA at Carol Evan's studio! It is nice to see the beautiful weather come back to us each spring isn't it? Two years ago when we moved in to our current home, I bought myself a beautiful sleek ceramic bird bath. It was awesome and I loved it. I brought it into our storage building during that first winter because I know that ceramics don't do well in super cold freezes. But, I forgot to do that this past winter. Big mistake! The bowl of the bird bath broke into many pieces, but the stand was just fine. So what does a glass bowl maker do when a bowl breaks?? They make a new bowl! So here is my version - it is made with a clear glass scrap melt, black sgraffito and colored enamel background. It is about 16" diameter and I used a rough octagon of kiln posts to slump it over for this fun ruffled edge effect. I love it and so do the birds! I have been a glass artist for over 25 years. But I have also been a quilter for more than 10 years. Glass turned from a hobby into a career rather quickly and I have never regretted that. Quilting has always been something I do to keep my hands busy while watching TV at night. I don't generally sell my quilts - I use them around the house, for warmth or decoration, or I give them as gifts. I prefer to sew by hand, but use the machine for much of the piecing and save the applique and hand quilting for the couch where I can cozy up with my blanket, dogs and cat and husband. My sister, Kristin Shields, is the one who got me interested in quilting (and knitting for that matter). She is 4 years older than me and I have to admit that I still look up to her and want to do what she is doing. I love her work and her style. Several years ago she turned me on to the term "Slow Cloth". I am not a very consistent quilter and have only made maybe a dozen or two quilts over the past years. But since moving to Oregon in 2015 and being closer to Kristin and the incredible quilting community here, I have been going through my work a little more quickly. I was recently prompted to make this little applique dog quilt by something mentioned in our quilt guild meeting this month. Our guild is having our annual quilt show in August in Sunriver, OR and they will have a display of appliqued "critter" quilts. I had just drawn this design to make into a small glass bowl and thought it would be great in fabric as well. While I was working on this quilt, I decided I wanted to try some "Big Stitch" quilting. I played around more with the color of the thread and the spacing of the stitches and didn't really worry about perfect, tiny quilting stitches. It was so much more relaxing and fun to do. This was such a quick project that when I was done I was itching to do more work in a similar vein. I had pieced together this other quilt many months ago and had always intended to do some embroidery stitch work in the blocks. One afternoon I quickly sandwiched it together with the batting and backing fabric and sat down to stitch. And the term Slow Cloth came to my mind. I pulled out my trusty iphone and googled the term which I hadn't thought much about in several years at least. I came up with this article of a talk given by Elaine Lipson in 2012. I read the article and then dove into my stitching. I was reminded that hand work, art work, should be done well, should be done with mindfulness and should be enjoyable. As I stitched away I continued thinking about the philosophy and reminding myself to slow down and enjoy the process. I have been working on this quilt for several days and really look forward to sitting down to it each night. You might be wondering how this applies to my glass work. Well, I have recently been working on a slightly different technique from my normal work. I am fusing my clear glass scraps into round blanks that can be painted on and turned into bowls. I began using this Slow Cloth idea and applying it to my work in the studio. I feel my work is always done well, with mindfulness and is enjoyable, but I had begun taking those things for granted as you do when you are trying to make a living doing your art. I am trying to create "Slow Glass" by slowing down, taking my time and letting the work flow more. For example, I am doing some sgraffito work on these new pieces. In that process, I could simply transfer my pre-drawn designs onto the enamel and scratch the design in. But I decided to try going free-hand and just let the work be molded by what's in front of me. Since they are done without the benefit of a compass, a ruler or an eraser, they may have wonky circles or mismatched arches. I am okay with that. They feel very organic, unhurried and fun. Images are In-Progress shots - not fully finished bowls. I hope you like them too. I am making this first batch with a white wash of enamel on the backs to create some bold black and white designs. Very different from my normal bright and colorful pieces so they may appeal to a different crowd. I have more ideas for these pieces and look forward to playing with my "Slow Glass" over the next several months. I am just pleased as punch to share the news that I have again been juried and accepted into Art in the High Desert for 2017. This is a premier art show in the Pacific North West and I am so excited to have passed their rigorous jury process for the second year in a row. Come check this show out August 25-27, 2017 on the banks of the beautiful Deschutes River in the Old Mill District of Bend, OR. If you can't make it to this show, perhaps one of my others would suit your schedule -- see where I will be this year here. Just Added - Workshop in Denver! I am happy to announce that I will be teaching another of my 3-1/2 day Reverse Glass Painting with Opaque Enamels workshops in September 2017 at D&L Art Glass Supply in Denver, CO. This will likely be my last workshop of 2017, so don't miss out if you are interested! Check out the info and link to sign up for this class here. Or check out my Workshops page to see other upcoming teaching venues.